Released the same year as “Moving Pictures”, after their successful promotion tour for it, “Exit…Stage Left” closes out Rush’s second era with another live record. Recordings this time were taking from a two night stint at The Apollo in Glasgow, Scotland, and one night at The Forum in Montreal. Coming on the heels of their then most successful era and their most successful album, “Exit…Stage Left” could be seen as an undeniable triumph by the band and a chance to show them at their best. …So, why do I not like this record very much? From what I’ve read, a lot of my problems with this record have to do with the mixing. 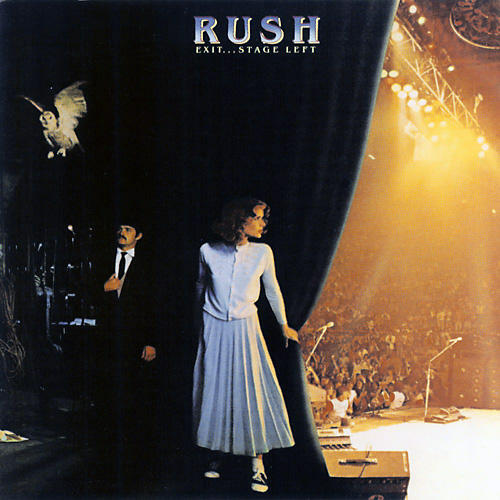 “Exit…Stage Left” was one of the first live records to use digital mastering, which “Moving Pictures” had also used. However, it worked better for “Moving Pictures” than it does here, with all the instruments on “Moving Pictures” being glisteningly distinct and blending together seamlessly in the mix. Of their own admission, Rush cleaned things up too much when they got to “Exit…Stage Left”, and it leaves the record feeling quite sterile. Geddy’s vocals are very low in the mix (his portions speaking to the crowd being extremely muffled), Alex turned up the levels on chorus and flangers way too high so a lot of his dynamics are lost, and perhaps most damning? The audience is barely heard. Part of the fun of a live record is hearing the energy and excitement of an audience cheering for their favorite band. For the most part, the audience is removed completely during the performances. When they do pop up, like in the designated cheering section of “Spirit of Radio”, the singalong of “Closer to the Heart”, or when the band does some vamping before “Jacob’s Ladder”, it’s a breath of fresh air. Is there anything good about “Exit…Stage Left” though? Well, sure there is! Because the performances are so close to the studio versions, it’s when the band goes off script that things become the most entertaining. Inserting Neil’s drum solo into the middle of “YYZ” was a genius move (though this is probably the shortest one on any Rush album), Alex’s classical guitar solo “Broon’s Bane” (essentially an intro for “The Trees”) is a pleasant set piece, and Geddy singing in Yiddish during “La Villa Strangiato” is a hoot. Make no mistake, the band is spectacular and the performances are tight as always. A document of their tour behind their best record should have been their version of a victory lap. It’s just a shame they got let down by the mix. MY RATING? Good, but sadly not great.